Air New Zealand has a relatively old fleet, which it is now rapidly replacing. It has plans to acquire eight new Boeing 777-200ER and two 787-800 aircraft at a cost of NZ$1.35 billion, which will revamp the airline and put it back in among the main players. At the moment though it has a rather confused fleet, where in one journey you can be on the newest of new 777s, transfer to rather old 767, and end up in a A320 operating as a no-frills flight. Domestic around New Zealand there are two classes (or one and a bit), while international there are three (or two and a bit). To make it more complicated, on domestic there are two types of service - mainline, branded as "Domestic Express" & NewZealand Link (for the smallest airports). Neither has any business class service, but in the mainline operations the planes have a Space+ areas over the wing with a bigger seat pitch. Food is dependent on the time of day, with breakfast in the morning, and an evening dinner service. There are also two types of ticket: Saver and Flexi. Trans-Tasman or Pacific gets much more complicated. These are flights from Australia to New Zealand over the Tasman sea, or to the Pacific islands excluding flights that stop at the islands en-route to the US. The new "Seats to Suit" service offers more, if you pay more, on these shorter routes. Seat is the cheap option with a cabin bag. Seat+Bag adds checked in luggage. Neither of these options includes and inflight meal, but The Works does, including a free bar. Finally there is Works Deluxe which has lounge access and a guaranteed empty middle seat beside you. Both Works and Delux come with access to the films on A320 trans-Tasman flights, but there is no point in buying it for the movies on Boeing 777 services: every flight has access to these films. Air New Zealand is also reintroducing Space+ seats on the Trans-tasman routes: Gold freqent flyers can book these seats as a free upgrade (although they don't come with free food either): see the hints and tips for details of how to book these. The trans-Tasman Airbus A320 fleet is being re-fitted with 35 inches of legroom in the first three rows, and then the 33 inches in the next three rows. 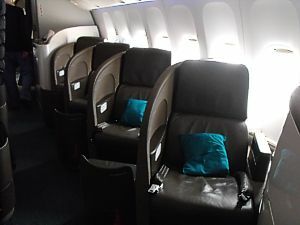 These are only available to Works or Works Deluxe passengers, and only Gold Elite and Gold members of Air New Zealand's Airports programme are allocted these seats. Gold Star Alliance members could also get this upgrade free either at checkin (if there is space available, which is rare), or by calling the service centre (although success here varies). Interactive colour seating chart for Air New Zealand 777, with pictures of every seat & cabin..
On most of the Tasman and Pacific routes Business Class is no longer offered, however occasionally a long haul aircraft does the rounds (once a day to Sydney, Brisbane and Melbourne). 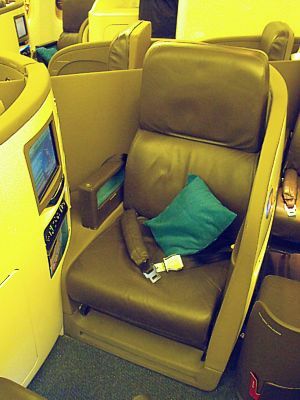 These are rare: on these flights a true business class service is offered, and Pacific Premium Economy is offered as a bookable free upgrade for frequent travellers (Koru Gold Elite & Gold) plus Gold Star Alliance members. Long Haul the old system of First, Business & Economy has gone. Instead Air New Zealand's best class is now called Premier Business Class. Instead of inventing it's own seat for this new class, it has instead using the sames seats as you'd find on Virgin Atlantic's Upper Class Suite seats, which it has leased. All seats in the 747s and 777s have these seats with an almost flat bed (6'7" long), and a large TV screen - but force you to sleep every so slight curved and sloping downhill. The old seats had a rather poorer fabric than Virgin, and indeed things like the headrest are a rather dull brown plastic. However Air New Zealand have recently uprated the seat, and it now has a soft leather trim in lighter colours. Pacific Economy remains economy, but at least longhaul you now get an (8.4") seatback TV - a new concept for Air New Zealand recently (although other airlines have offered them for a decade), and a fairly comfortable seat. It has a headrest which slides up, and wings that come out which you can rest your head on. 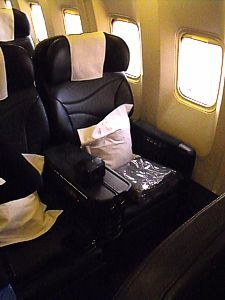 ... read more about Air New Zealand Seatback TV. Finally there is the new Air New Zealand Pacific Premium Economy. These again come in two variants (old, and new). You do not get access to the Koru Club lounges with Air New Zealand Premium Economy, but the newly uprated seats offers much much more than most premium economy seats. 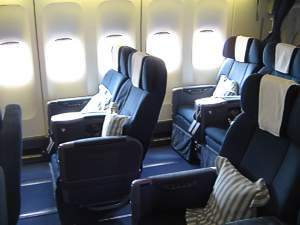 The old Premium Economy seat has a similar concept to World Traveller Plus on British Airways; in effect you pay for a seat with more legroom (40" pitch) and on the 777s and 747s, and a seatback TV with AV on demand (AVOD). 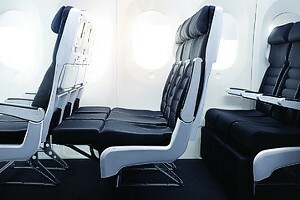 The new Premium Economy seat is a totally different beast, set at an angle to the cabin, in white leather. It is only on the 777-300. 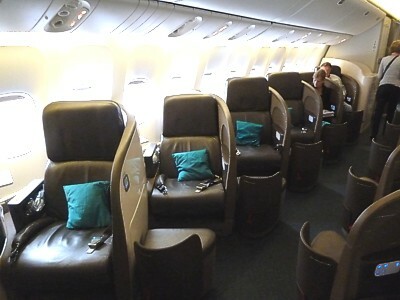 Premium Economy seats are located in a dedicated cabin which shares lavatories with the Business Class cabin. A perk is the class has the same mood lighting, and inseat power for electronic devices such as laptops as the Business Class cabin, along with the same wine selection (although you may not be able to access the wine list to find out what's there) - but the food remains the cheap stuff you'd get in the back of the plane. Demand for this class is very high indeed. Incidentally, don't get confused. Premium Economy used to be called the Space+ cabin on longhaul, and offered 35" pitch. It was available as a free perk to Gold frequent fliers (Koru Gold Elite & Gold plus Gold Star Alliance members). It was subsequently scrapped due to the cost. Alas, with the move upmarket in this class, free upgrades are now not handed out at booking. Air New Zealand also had a low-cost offshoot, Freedom Air, which flew between New Zealand, Eastern Australia and Fiji. Created in 1996, it was axed in 2008, because Air NZ found that passengers were confused by the two brands, which had similar fares but a reduced on board service. All flights which were Freedom Air are once again branded as Air New Zealand. Air New Zealand Express is also a defunct brand. It was Air New Zealand's name for Tasman (to Australia) and most south Pacific flights. 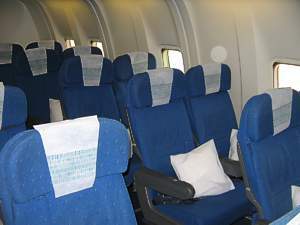 The Seats to Suit service replaced it, when Business Class was axed. Air New Zealand has a total of eight 777-200ER (the extended range version) which seat 304 in 3 classes, and five of the larger 777-300ER model, which will start to replace the Boeing 747s. The Air New Zealand's 777-300ER is by far the aircraft of choice, as this has the new "skycouch" seats, premium economy, and the uprated business class with inflight wine bar. The older 200 ER model seats 26 in business class, 36 in premium economy, and 242 down the back in economy. They are used on the flagship route from Auckland to London Heathrow via Los Angeles, Tokyo, San Francisco, Shanghai, Beijing, and on some flights to Rarotonga and Nadi. Very occasionally you may get lucky enough to snag one across the Tasman from Sydney or Melbourne. 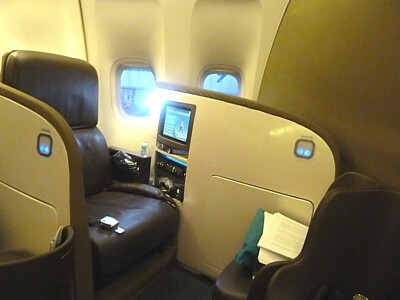 All seats have a personal entertainment system, with seatback TV screens and AVOD. Business Premier Class has the fully lie-flat 6 foot 7 inch long seat, which is leased from Virgin Atlantic. 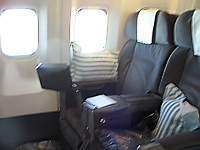 Like that airline, these seats are in a heringbone fashion, which can be a problem if you are a couple seated together, however the comfort of the seat more than makes up for that. Business is in the nose, where it should be, with 6 rows of seats in a 1-2-1 layout. Oddly, the front row is row 2, and it carries on to row 7. Rows 3 or 4 by the window tend to be the most popular, because in row 2 you can hear the crew chattering in the galley. There is a large 10.4" screen, which folds out from the bulkhead, and large noise cancellation headphones. Pacific Premium Economy (Economy Plus, also called Space+) Class has just 4 rows in a 3-3-3 layout, and to be fair the seats are pretty much the same as they are in economy, however the legroom is superb, at 40 inches. This is the older much worse Premium Economy seat, and should not be taken if you are offered a ride on the newer 300 model. Indeed in all except the front row this can be a bit of a problem where you end up squinting at the (admittedly) quite large seatback video screens (which is 8.4" wide), and so for this reason row 23 is highly prized, because it has a flip out video screen in the armrest, and acres of legroom, however the armrest is fixed to the seat, which means on those long flights over the Pacific, you can't fold it out and sleep lieing down the row of seats; although this is rarely possible on in Premium Economy anyway, as these cabins are always packed out. Pacific Economy Class on the 777-200 is pretty standard, with a 3+3+3 layout, and smaller video screen of just 5" screwed to the seat ahead, although you can get as much legroom as in economy plus if you ask for the rows with a bulkhead, row 34, or row 53, an emergency exit. However beware of row 34 as it's right by the rack of 5 economy toilets (although there are 2 more in the rear). 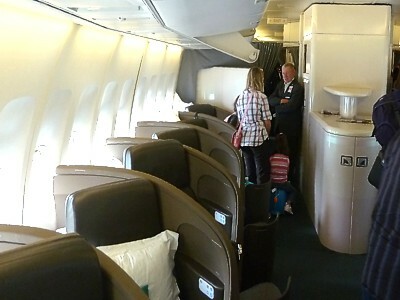 The new Air New Zealand 777-300ER has a totally new cabin, which was designed for the forthcoming 787. It is a delight, and should be taken at all costs if you are in a premium cabin, but avoided if you are in economy. There is mood lighting, which changes colour unobtrusively throughout the flight to suggest daylight and timezone changes. This is a real improvement on the old glaring fluorescent aircraft lighting. The 777-300ER has 246 Economy seats (including 66 seats that will create the Skycouch combinations), 50 in Premium Economy and 44 in Business Premier. On the plane food gets a revamp too, and can be ordered on demand via the seatback TV IFE. 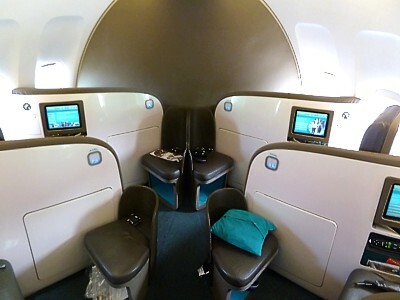 Business Premier Class on the new Boeing 777-300ER is absolutely state of the art. 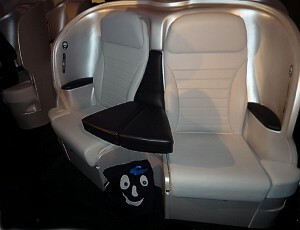 It has the same lie-flat herringbone seats at the 200 model, but with lighter creamy leather with matte white trim, plus accents in deep inky purple, indicating that you'll get the better AVOD IFE. There is an in flight wine bar for business class on these aircraft: it is up at the door where you walk onboard, and is very swish, relaxing and stylish. It has wine tastings in-flight. When you are here, spot the Air New Zealands great self-righting wine glasses. Most novel are the flat beds in economy: the first 11 window rows of Economy class will feature the Skycouch, where a row of three seats can be turned into one of 22 horizontal lie-flat beds for two adult passengers. Do not try to book these if you are travelling alone - all three seats need to be booked, at US$200 more than economy, along with the cost of the third seat at half price. Economy is alas in a 3-4-3 layout, with a 33" pitch, so it is much more crampt than old economy with the 10 abreast seating making for a tight squeeze. The ultra-narrow aisles are really woeful. The seats are also in a dark charcoal grey-black with white plastic trim: functional is a little dull. Premium Economy on Air New Zealand's new 777-300ER has had a radical revamp, that turns it almost into business class: The seats feature hard back shells, with seat recline of 9". Layout is 2-2-2. Designed by "Contour of Wales" the seats angle outwards from each other, providing some privacy. All news reports of the new seat have highly commended it. However, the strange angle of the tables in Premium Economy are a bit of a pain to work on, as you are continually at an odd angle. A novel feature is the purple ottoman beanbag that replaces the footrest in Premium Economy: it's rare to see one left on a flight, as they are often taken by passengers as a souvenir. Their name, by the way, is "Otto the glittery beanbag". NEWS: Air New Zealand is buying the new Boeing 787. It has eight 787-900s on order. With this new aircraft it plans to open new routes from 2014, and scrap the 747. Air NewZealand has five 747s in the fleet, and plans to retire three soon. They have now all been converted from the old 3 class fleet to the newer layout with Premium Economy class. 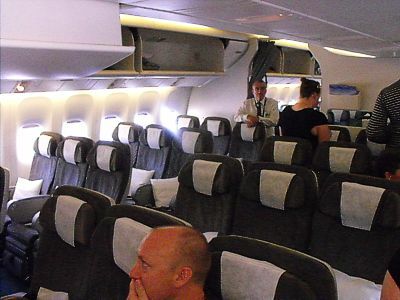 Bizarely, the airline has split the upper deck into a two class layout. 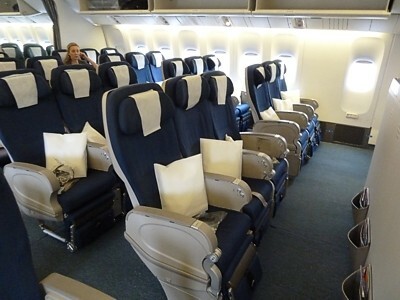 The new layout seats 46 in business, 39 in premium economy, and 294 in economy. There are 46 seats in Business Premier Class, which are the leased Virgin fully lie-flat 6 foot 7 inch long version in a 1+2+1 layout downstairs, and 1+1 upstairs in the front half of the bubble behind the cockpit. Children won't be seated here it's much quieter, plus you can get a lot of attention from the cabin crew. The window seats here benefit from a huge cubby hole low down under the window, which is large enough for a carry on case. However the windows here slope so much its impossible to get a decent view of the ground. All seats have a personal 10.4" video screen with Video On Demand. A few 747s are left with the Old Business Classseats, with a pitch of 50 inches, a 2+2 layout on the Upper Deck, and 2+3+2 on the Lower Deck. These seats have a small 4" fold old personal TV screen for the Inflight entertainment system. Pacific Premium Economy (Economy Plus, also called Space+) Class has, as you would expect for the extra money, pretty good legroom at 40 inches, and seatback video screens coming in 8.4". There are two side "wings" of PE downstairs in row 27 to 30, beside the staircase (with just 2 seats on each side in each row). 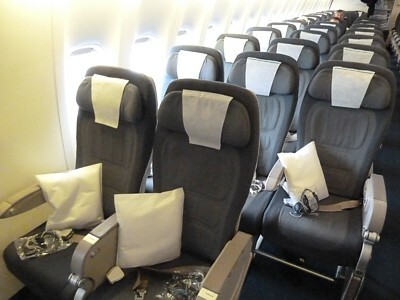 An unusual perk is that Air New Zealand have put a few Premium Economy seats on the Upper Deck, with a 3+2 layout. Snagging one of these 23 seats is a real plus. Children are not seated here, and the cabin has a very cosy feel. Pacific Economy on a 747 has 324 seats in a 3+4+3 pattern. With the bulkhead and emergency exit seats not only can you get out of your seat without problems on a long flight, but there are also fold out video screens (on the revamped aircraft) and a table in the armrest, although beware that this eats into your seat width. These emergency exit seats are highly prized, and are normal reserved for Gold Airpoint members. Exit row 31 is good, as are 43 and 53. At the back of the plane, due to the aircraft's shape, seat arrangement is 2+4+2 in rows 57 to 59, and are highly prized by couples who want two seats without having to step over the person in the isle, however these seats are near the rear toilets. In 747-400s row 31 gets a bulkhead, but may also get a fold out cot, so you may be blighted by children. Row 43 gets lots of legroom with an overwing door - but no window! Row 53 is best, as it gets an emergency exit, a window, and no cot. It's also not over the wing - and is by far the best selection. Beware of booking window seats in rows 35, 36, and 37, as these seats get a blank wall instead of a window. Air New Zealand has recently cut down it's 767 fleet, and now has just five Boeing 767s, four of which have been retrofitted with the new cabin interior. The 767s are mainly used on the Tasman routes, including the once a day to Perth, plus Los Angeles via the Pacific Islands such as Raratonga, Nadi and Papeete. It also appears on the flight to Osaka. 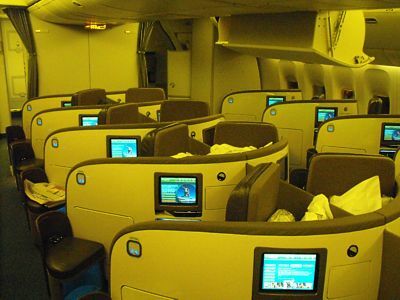 There are 24 seats in Business Premier Class, which are in a 2+2+2 layout with 4 rows. 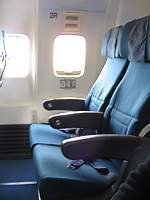 Seats in both the new and the non-revamped planes are similar with an old fashioned 50 inch pitch, with a 60 degree recline. However the new seats are leather and slightly more comfortable. However this regional business style and does not include the full lie-flat Business Class seats you'd get on Air NZ's 747s and 777s. Row 1 is a bulkhead, and in E and F it feels quite crampt, plus they are right next to the forward toilets. 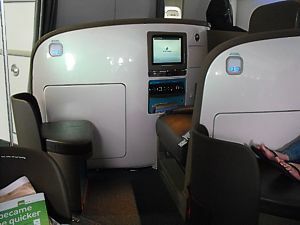 All business class seats have a personal fold-out video screen with Avod. There is also a Mainscreen CRT screen on the ceiling displaying the route map. 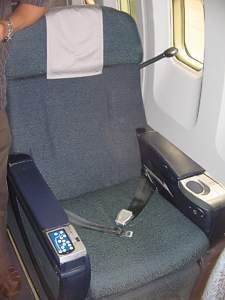 Pacific Economy seats are in a 2+3+2 pattern, with 210 seats. There are now seatback TVs, with AVOD, however the seats are really nothing to write home about. Exit row 18 is good, with lots of legroom, and there is also more legroom in row 19, but these are just behind the toilets. There is a Galley on the side of the forward cabin, as a result row 10 on the left has increased space thanks to the bulkhead, but it is difficult to see the movie screen. Row 39 and 40 are near the rear toilet block, and suffer from passing passengers throughout the flight. Avoid row 15 - it has no window, and should be avoided at all costs, and Row 14 equally only has a small segment of a window. Space+ seating is still economy class, but it has a bit more legroom: Gold Airpoints & Star Alliance members (plus full fare passengers) can ask for this: it is located in the front few rows of the cabin. Air New Zealand has plans to replace the 767s eventually with new Boeing 787-900s, however there have been so many delays with this aircraft, it will be several years before the 767 stops flying with Air New Zealand. NEWS: Air New Zealand is to reintroduce the Space+ brand on its A320 fleet. Thist will offer up to 35 inches of legroom in the first 12 rows. Air NewZealand has fourteen Airbus A320s. Twelve are used on international routes, plus two are used on domestic (these two came back from the subsidiary Freedom Air, and only contain one aft toilet, which is aft of the rear doors), with another 12 on order. They are used for Trans-Tasman and Noumea flights and certain Auckland to Christchurch services. 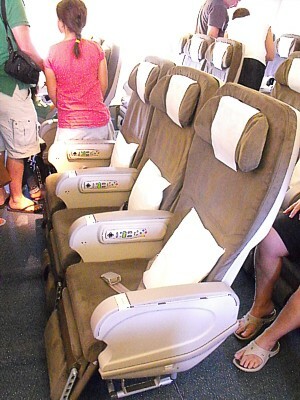 They are used for these longer international flights, and as such have full Space+, and economy cabins. There are 12 rows in the Space + class, which are in effect economy seats but with a bit more legroom. These upgrades are offered for free to Gold Koru club members. Economy has a 3+3 layout, and 138 seats of 32" pitch. Exit Row 11 has a bit more legroom (and is also treated as a Space+ seat). There are dropdown LCD screens every 3 rows. The Airbus A320s will replace Boeing 737-300 aircraft on domestic routes from 2012. On a few A320 you may still get the original Business Class cabin. This has been scrapped, which is a shame as it was pretty good on the A320. 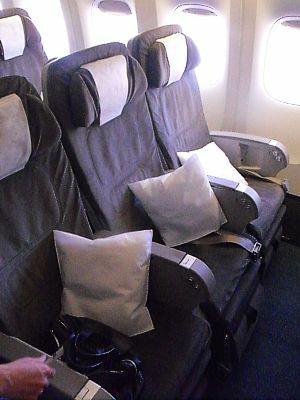 Air New Zealand have fitted full business class seats, with 2 rows in a 2+2 format, and a pitch of 42". The recline was about 120 degrees - not flat, but you can certainly sleep in them on the Tasman redeye. There is a good reading light in a bendy stalk. There is no video screen, so handheld DVD players were offered with a library of 15 titles, on flights over three hours. Air NewZealand has fifteen Boeing 737s. All are now configured in a single-class layout. They're used for domestic main trunk services, and certain leisure-based international routes such as Brisbane to Christchurch. 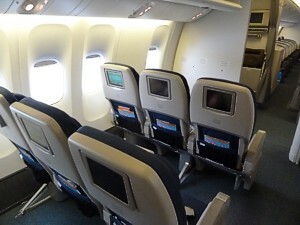 Pacific Economy Class has 136 Seats in a 3+3 layout, and a pitch of 30". It's pretty basic stuff with no entertainment or in seat power supplies. 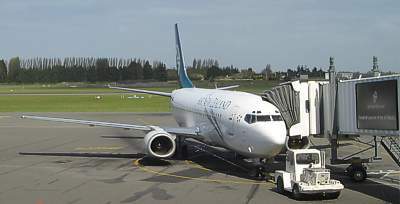 Interestingly, Air New Zealand had the last 737-300 to come off the production line, and it's pretty rapidly scrapping it: not that there is anything wrong with the aircraft, however Air New Zealand has decided on an all Airbus fleet shorthaul.